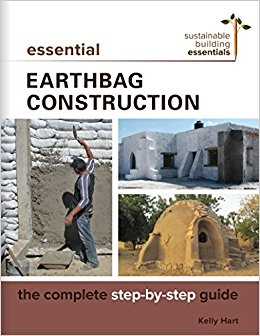 A new book about earthbag building has just been published by New Society Publishers, titled Essential Earthbag Construction: the complete step-by-step guide. I wrote this book at the publisher’s request, as they are issuing a comprehensive series of essential guides about a wide range of natural building methods and wanted to make sure they covered earthbag construction. This book is particularly detailed in its description of what is involved in designing and building with earthbags. It also features a lengthy foreword by Owen Geiger outlining many of the recent developments that have occurred around the world. Chapters cover the history of earthbag building, appropriate uses for earthbags, material specifications, tools, and building science notes that describe the principles that control the thermal, air, vapor and water infiltration within an earthbag wall. The construction options for foundations, walls, roofs, floors, plaster, utilities and seismic reinforcement are discussed in detail. One lengthy chapter examines design considerations and constraints. In addition to all of this, the book delves into budgeting, maintenance and renovation, building codes and other uses for earthbags besides buildings, such as retaining walls, cisterns, dams, cellars, and sculptural art. There are many diagrams and photographs showing exactly how components fit together, as well as a color insert of pictures of earthbag projects from around the world. A resource guide lists how to access more information and there is even a comprehensive index. I would say that the book really does live up to its title of being a complete step-by-step guide. In comparison with my earlier book, Earthbag Architecture: Building Your Dream with Bags, this book goes into more detail and is generally more comprehensive. Essential Earthbag Construction should be available at bookstores near you, as well as online at sources such as New Society Publishers and Amazon. This is great! I’ll be getting a copy! I’m very happy to see this new earthbag book by Kelly. Because it’s by a major publisher, it will get into lots of libraries, schools and bookstores, and therefore reach a much wider audience.